The sudden appearance of three mystery doorways in an enchanted forest has sparked endless imagination in children. 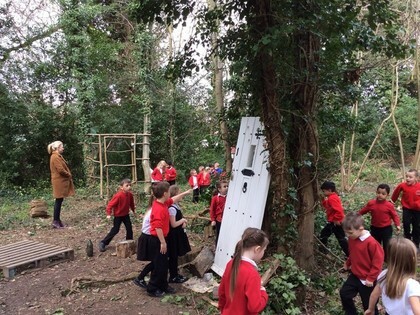 Pupils arrived at Little Parndon Primary Academy to find the doors within the school grounds, with no idea where they came from or what was behind them. The discovery – which included a set of keys and a jar of potion - was set up as a hook to give pupils something exciting to focus their writing on. Kirstie Clark, head of school, said: “One door was made from branches, another was an old Victorian door and the third was a mini Borrowers door. “Pupils wrote reports and stories predicting what might be behind the doors and how they came to arrive in school. They were trying to work out which keys might work and whether the potion would maybe shrink them down to fit through the Borrowers door. “Children can sometimes struggle to get into their writing and to have something that is unusual to focus their imaginations is always a great hook. Even the reluctant writers can’t help but be inspired. It’s about providing something for them to write about.